The scientific name Farlowella acus has been mistakenly attached to many members of the genus Farlowella over the years. In fact to this day many general aquarium books include a photo of a Farlowella mislabeled "F. acus." The pictured animal is almost always the commonly imported F. vittata, which hails from the llanos (great plains) of Venezuela and Colombia. The true F. acus is shown here and has a very distinctive with its short broad rostrum (or "snout") that makes the fish look it has a Farlowella body with a Sturisoma head attached. In fact, Kner (1853) originally described it not as a Farlowella sp, but Acestra. F. acus also has a very restricted natural range. Is known only from two small drainages in the Venezuelan central Andes, and both of these drainages have become heavily polluted. It is now limited to a handful of small, clean feeder streams that drain into the Rio Tuy and Lake Valencia basin. F. vittata above, F. acus below - compare rostrum. All Farlowella species are collectively called "twig catfish" in the hobby. Despite the fact that there are more than two dozen described Farlowella species., none have their own specific common name. Furthermore, I can not explain why so many books mislabel various Farlowella as F. acus, but it is possible that F. acus was exported many years ago. There was a time many years ago when fishes from Lake Valencia, such as the diamond tetra and Corydoras venezuelanus, were common exports. It is possible that F. acus was exported at that time and correctly identified. However Farlowella collecting for the hobby shifted to the llanos of Colombia and F. vittata and F. mariaelenae became the two most commonly exported Farlowella. So it would appear that the fish changed, but nobody bothered to change the name. Many aquarists report the keeping of Farlowella as problematic. All members of the genus that I have collected and maintained have proven good aquarium fish when properly cared for. Many Farlowella are in a poor state by the time they reach a retail store. It is important that the group, or individual, be immediately placed in a quarantine aquarium and allowed to regain their strength. These fish are very poor competitors for food and greatly benefit from some alone time to put on weight and become accustomed to typical aquarium fare. Once they are back in good shape they are hardy creatures. The aquarium water should be clear in color, soft, and have a pH near neutral. In the wet season the water is even cooler, as low as 70°F, and softer due to the heavy rains. F. acus is one of two hillstream Farlowella found in northern Venezuela (the second is F. vittata "augustini" from the Rio Chirgua drainage). Hillstream Farlowella are much more reophilic than most Farlowella and spend the vast majority of their time on the aquarium substrate facing into the aquarium's strongest current. As hillstream fish, they also appreciate cooler temperatures. 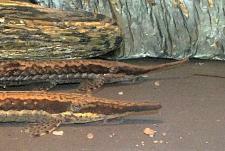 When considering a biotope, ideally, F. acus should be kept in a species tank given their special needs. The most important of these needs being cooler temperatures and a fair amount of water movement. For a biotope set up, place several well-rounded river stones about the tank's substrate. Over these stones add about one half inch of fine sand to replicate the typical substrate of a mountain stream. Along the back of the tank, place several small to medium pieces of bamboo that reach from the substrate to the water's surface. The final effect should be that of a section of a mountain creek flowing past the roots of a large bamboo tree growing along the riverbank. In addition to a hang on the back filter, a unidirectional power head with a venturi device should complete the set up. The above all said, with their gracile, elongated bodies all Farlowella are very poor swimmers. They never appear to swim in nature but simply "hop" or glide between the roots of floating plants, submersed tree branches, and the leaves of aquatic plants. Ideal tankmates for all members of the genus are small tetras or cyprinids (i.e. Rasbora), dwarf Corydoras, or other slender loricariids such as Sturisoma and Rineloricaria. Otocinclus and their close relatives are also a good choice. Many aquarists these days are dedicating aquariums to a mixture of colorful, robust loricariids. What about a heavily planted aquarium decorated with thin twisting driftwood branches and inhabited by various Farlowella, Sturisoma, Sturisomatichthys, Lamontichthys, Hypoptopoma, and Otocinclus? All of these species will spawn under these circumstances. Etymology Named after W. G. Farlow, from Harvard University. This specific epithet literally means needle (acus=needle) and refers to its long, thin appearance. Size 163mm or 6.4" SL. Find near, nearer or same sized spp. Identification Readily identifiable by its short blunt rostrum. No other Farlowella species share the same habitat/range of F. acus. Sexing Males develop fairly long breeding odontodes along the sides of the rostrum. General Remarks This fish is highly endangered and could easily become extinct in the next twenty years. Although numerous aquarium books show photos labelled as Farlowella acus they are most likely all incorrect. It is very doubtful that this fish has ever been exported for the aquarium trade. The holotype’s origin is listed as Caracas, Venezuela 8 August 1850. Reitzer and Page, 1996 state, “The type locality of Caracas probably refers to the general region of Venezuela.” However, I have encountered F. acus within the Rio Tuy drainage. The Rio Guaire, a tributary of the Rio Tuy, flows through Caracas and it would not be impossible that 150 years ago F. acus swam in the Rio Guaire. Thus the holotype may have actually come from the Rio Guaire or one of its feeder streams in the valley of Caracas. Distribution Originally plentiful throughout the Lake Valencia and Rio Tuy drainages. It may have existed in the Rio Guaire (which is part of the Rio Tuy system) that runs through downtown Caracas in the past or the holotype location above may represent where the holotype was shipped from. Now restricted to handful of small rivers that feed Lake Valencia such as the Rio Aragua and the uppermost headwaters of some Rio Tuy feeder streams. Other Parameters Water should be clear and high in dissolved oxygen. Feeding Captive feeding is easy and this fish quickly adapts to live, frozen and dry foods. Algae wafers should form the bulk of the diet and be supplemented with proteins twice weekly. Furniture Substrate should be fine sand and rounded stones. This is a reophilic fish that rarely leaves the substrate. Driftwood is mostly absent from their natural habitat but they congregate where bamboo stalks hang into the water. It is only found in cool rivers and streams with a fair amount of current. Compatibility All Farlowella spp. are peaceful fish that do not compete well with aggressive tankmates. Large robust loricariids, medium to large cichlids and fast swimming shoaling fishes do not make good tankmates as Farlowella cannot compete with them for food. Suggested Tankmates Other small peaceful loricariids such as Otocinclus, Parotocinclus, and other Farlowella spp. Breeding Assumed to be the similar to the rest of the genus with the male guarding the eggs but has never been spawned in captivity. Any published reports have turned out to be for misidentified species.